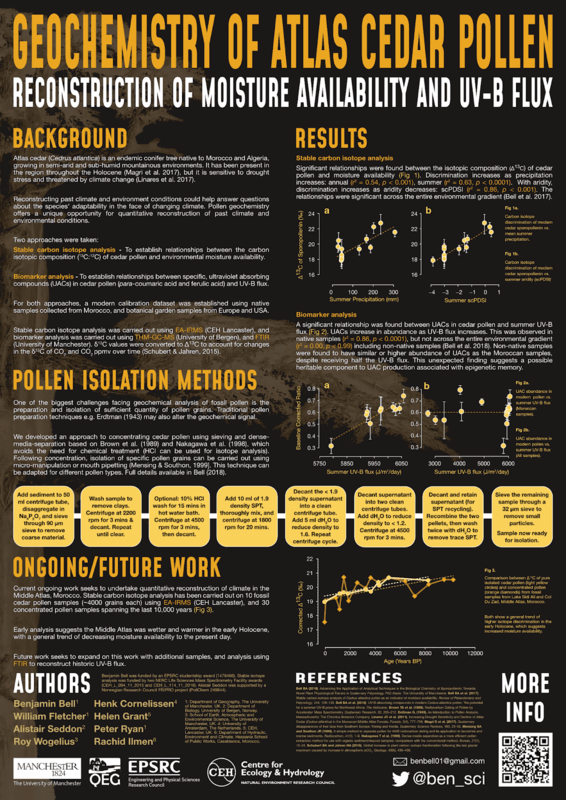 In my most recent published paper, I analysed the effects of incoming solar UV-B radiation on the geochemistry of Atlas cedar pollen, focused on the Middle Atlas Mountains in Morocco. The study area was relatively small, with sample sites fairly close together. The UV-B data was obtained from the glUV: Global UV-B radiation dataset, which combines data from NASA's Ozone Monitoring Instrument (OMI) onboard the Aura spacecraft, into grid cells containing average erythemally weighted estimates of daily UV-B radiation. You can read full details of the methods used in the associated research paper (Beckmann et al. 2014) (Available open access). Gridded datasets are an excellent source of data for doing global or macro-scale studies. However, if working in a relatively small area, you may find that your study area is covered by just a few grid cells due to the often low resolution of gridded data. And this can sometimes make it more difficult to carry out analysis. To overcome the problem, you can interpolate the data to increase the resolution. After interpolation, the gridded data will go from looking like the image on the left, to looking like the image on the right, which is much more detailed for the study area. Read on to find out how to do this in R! Climate diagrams are useful tools which provide a visual summary of average climate conditions for a place over a specified period of time. This guide will explain the different parts of a Walter and Lieth climate diagram, and show you how to create one in R using the "iki.dataclim" package. This package provides a really quick and easy way to make good-looking Walter and Lieth climate diagrams. But, this guide will also show you how to create one from scratch (no packages needed!). Last year I published a paper on the pollen morphology of Cedrus atlantica (Atlas cedar) pollen. 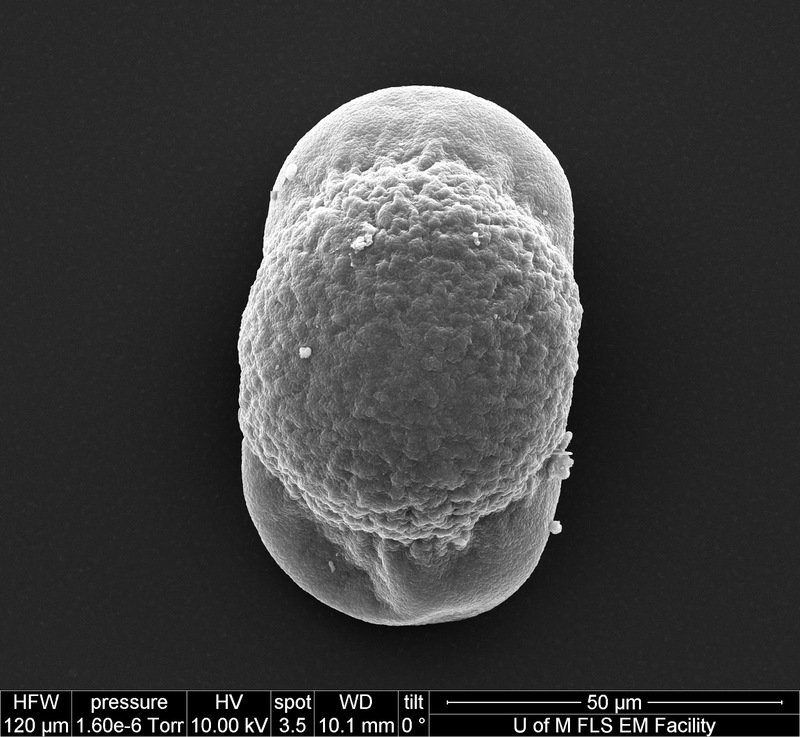 As part of this study I took several light microscope (LM) and scanning electron microscope (SEM) photos of the pollen grains. Some of the photos were published as part of the paper which is available open access here: https://doi.org/10.1080/01916122.2017.1356760, although the photos were scaled down, and not all of them were published, including the ones for Cedrus deodara (Himalayan cedar). A recent Twitter post talking about how researchers take loads of great photos, which are then scaled down for publishing inspired me to upload the originals. Please feel free to use the photos however you like! R has some really cool little features to make life easier. A couple of really useful features for dealing with long text or character strings are abbreviate() and strtrim(). The first will automatically abbreviate character strings to a specified number of letters, and the second will trim a long character string to a specified number of letters. These functions can be really useful if you need to shorten text - for example, in plot axes or legends. This quick guide will show you how to use both of these functions in R, and also take a look at paste() for further text manipulation. In my recent guide series looking at extracting, analysing and plotting climate data using R, I focused on two sources of climate data: CRU and WorldClim. These datasets provide all kinds of climate data, at varying temporal and spatial resolutions. But, as mentioned in the last post, there are many more climate datasets available, with data for even more climate variables. 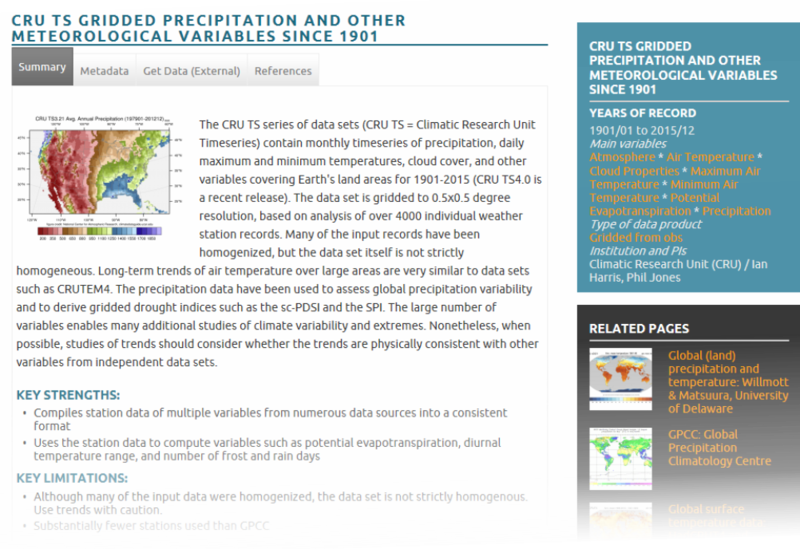 Visit the Climate Data Guide for a look at more datasets. Global climate datasets are not the only source of climate data. Raw station data is often available. Click read more to find out about climate station data available from NOAA, the Met Office, and the Environment Agency.